Planning or already growing a kitchen garden and unsure where to start or which plants will grow best in your plot? Or perhaps your fruit and veg aren't quite growing as well as you'd like? Horticulturalist and garden expert Matt James answers your questions about everything from sowing tips to pest control and container gardening. 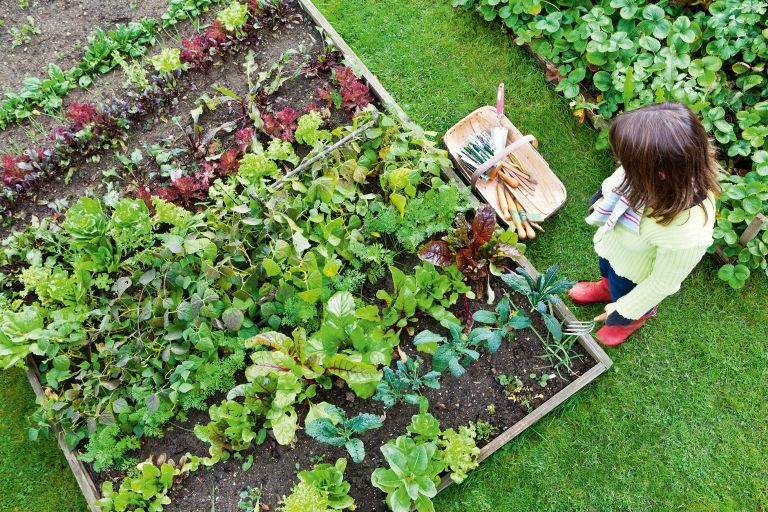 For even more practical know-how, check out our guide to planning a kitchen garden. Q. My tomatoes failed miserably with blight last year. How can I stop it from reoccurring? A. Tomato blight is most common in warm, wet weather. Outdoor tomatoes are much more susceptible to infection, with greenhouse crops less so. Symptoms include a watery rot on the leaves, which quickly collapse, brown lesions on the stems and patchy brown fruit. Prevention is the key. Water only at the base of the plant — water left on the leaves encourages the disease. Open up your greenhouse vents on hot days and never grow potatoes and tomatoes together, as blight affects them both. Bordeaux mixture is a useful fungicide for preventative treatment, but is not suitable for organic gardeners. Tomato varieties such as ‘Fantasio F1’, ‘Legend’, ‘Ferline’ and ‘Losetto’ offer some resistance to blight — try these instead. Q. Does sowing early mean earlier crops? A. In short, no. Plants need both warm temperatures and suitable light levels to grow strongly, so don’t sow too early (or too late), otherwise crops will fail to establish well. Follow the instructions on the packet. Growing crops under cover – a cloche, cold frame or greenhouse – will mean that they bulk up more quickly, though. Q. I’ve never grown fruit or vegetables. What are the best crops for a beginner? A. Reliability is most important, so choose disease-resistant, quick-to-mature, compact crops. Try ‘cut-and-come again’ salad leaves, spring onions, radish, mint, broad beans (try ‘Aquadulce Claudia’ for an early crop), runner beans, early potatoes, beetroot (try tough ‘Bolthardy’), cherry tomatoes and courgettes. All are easy to grow and suffer few pests and diseases. Don’t bother with the cabbage family, and even experienced gardeners find celery and cucumber a challenge to grow. Q. I’ve been thinking about getting an allotment. Any advice? A. Great idea, but only if you have time. Allotments need commitment, so look for a relaxed, family-friendly site close to home. If you’re offered a plot, size it up carefully. Avoid perimeter plots shaded by dense trees or infested with nettles and brambles. Check how far you will be from water taps, and where manure can be dropped off, too. Not all plots have water, so you’ll need a shed with guttering on both sides, connected to rainwater butts below to catch every precious drop. Q. I only have a sunny balcony; which crops grow best in pots? A. Try salad leaves such as ‘Saladini’ and baby leaf spinach in shallow trays. For baskets and window boxes, choose trailing tomatoes, such as ‘Tumbler’ and ‘Garden Pearl’. Perpetual strawberries also grow well in deep boxes, but regular watering is essential – ‘Mara des Bois’ and ‘Aromel’ varieties are suitable. Courgettes and dwarf runner beans (namely ‘Hestia Dwarf’) crop well in large tubs. In very hot sunny spots, sweet peppers and aubergine are good, as are herbs such as basil and sage. Early potatoes (try ‘Swift’ or ‘Charlotte’) are a doddle to grow with peat-free compost in an old compost bag or plastic dustbin. Q. What grows well if you have heavy clay soil? A. Without grit and compost dug in for drainage, few fruit and vegetables thrive in thick, heavy soil, although rhubarb and brassicas such as cabbage and Brussels sprouts do better than most. If the soil is difficult to dig, build raised beds filled with quality compost, or grow crops in pots. Q. I’ve inherited a vegetable plot but it’s infested with weeds — what’s the best way to get rid of them? A. Before you start growing, a weed-free plot is essential. The easiest way to control weeds is to hoe them off, or pull them out by hand as you dig deeply to relieve compaction and improve drainage. With perennial weeds such as dandelions and docks, you need to get out all the roots. Alternatively, cover the soil with cardboard or a temporary layer of landscape fabric, topped with a thick layer of mulch. Given time (usually at least one growing season), this is enough to kill all but the most persistent weeds such as horsetail and couch grass. A systemic herbicide, which kills the roots, might be the best option if you are impatient, but read the instructions carefully — when growing edibles, I personally don’t like using chemicals. Growing organic is best for your health and the environment. Find out how to grow organic fruit and veg in our guide. Q. I have a healthy apple tree that flowers well, but rarely fruits. What’s wrong? A. If fruit trees are healthy, disease-free and haven’t been pruned hard recently, it is usually due to the lack of an appropriate pollinating partner. Introduce another variety, such as Malus ‘John Downie’ crab apples, which flower at the same time. If short on space, grow ‘Cox’s Orange Pippin’ or ‘family’ trees where three varieties are grafted onto the same tree to pollinate one another. Q. What kind of crops can I grow up the walls that surround my courtyard garden? A. For sunny walls, try squash, pumpkin (‘One Two Many’ is prolific), climbing French beans (‘Cobra’ is good), and espaliered dessert apples and pears. In a hot spot try a Brown Turkey fig, although it will need space. For shady walls (less than five hours of sun a day), grow acid cherries (‘Nabella’) and cooking apples. A vertical growing system or ‘living wall’ is also an all-weather option. Q. I’ve had cabbage root fly this year — help! A. Young brassicas are most at risk from mid-spring through to early autumn when the temperature is consistently warm; older plants with mature root systems are more tolerant. Cabbage collars, available from garden centres, will help. The female flies lay their eggs on this, instead of the soil, and the eggs don’t survive. Q. Can I still use old seed if it’s past its use-by date? A. No harm will come from using old seeds, but you won’t get such a good germination rate. With larger seeds, try sinking them in water — if more than half float to the top, then use a fresh packet. For small seed, sow a pinch in an envelope of damp kitchen towel, then place in a plastic bag in a warm spot. If after 7–10 days less than half have germinated, buy a new packet.